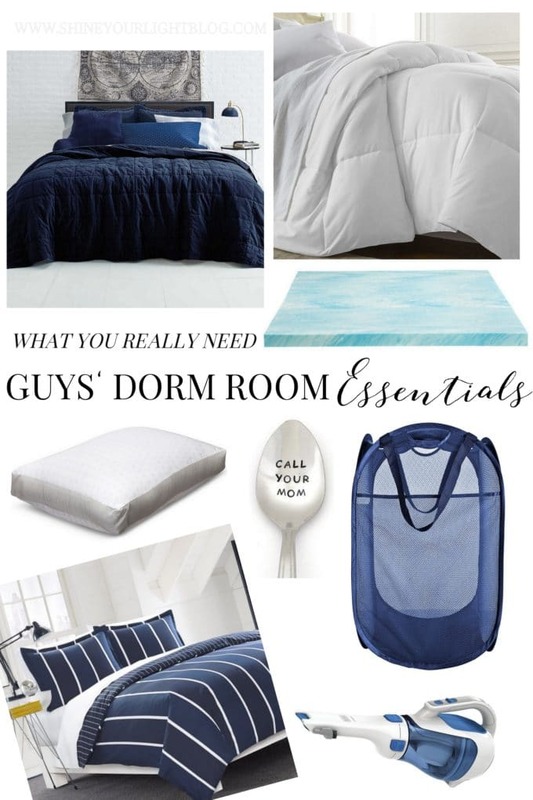 The Guys’ Guide to Dorm Room Essentials | What he really needs! Peter is heading off to college two weeks from today. So let’s just get right to stifling feelings and discuss what the heck a typical male needs for a dorm room. Because right now emotions, nope! But if there’s a room that needs some help?? That I can handle! Something like this room is what my kiddo will be calling home for the next 4 years. As opposed to the girls who were enthusiastically going on college shopping trips with their moms and friends, Peter apparently would rather stick needles in his eyes than pick out bedding, and since he has been working a ton this summer I’m more than happy to do this for him. Before checking everything off the packing list Peter’s college sent out, I polled our older nieces, nephews and college-aged friends for what they would consider must-haves for their dorm rooms and threw in some of my mom-sense (I might know a thing or two about domestic necessities 🙂 ). In my informal polling, it was interesting to me what were dorm room concerns to the gentlemen vs. the ladies. The guys – a comfy bed and a place for food. The ladies – that the room feels organized and aesthetically pleasing. No statement about man vs. woman here, but what it all boils down to as far as I can tell is giving a dorm room the comforts of home! 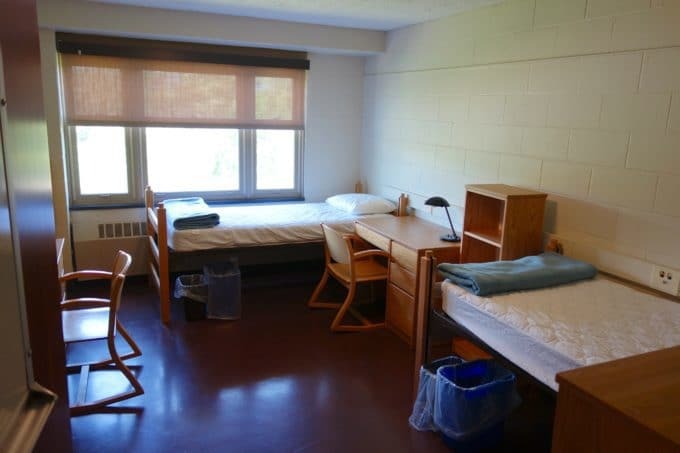 Since our kids are all heading off to college in short order, I thought I’d keep running lists of the absolute essentials for college dorm living. If you are heading to college or shipping off your kid sometime soon, here’s the guy’s function-over-form list we’ve culled together with our college-aged advisors. 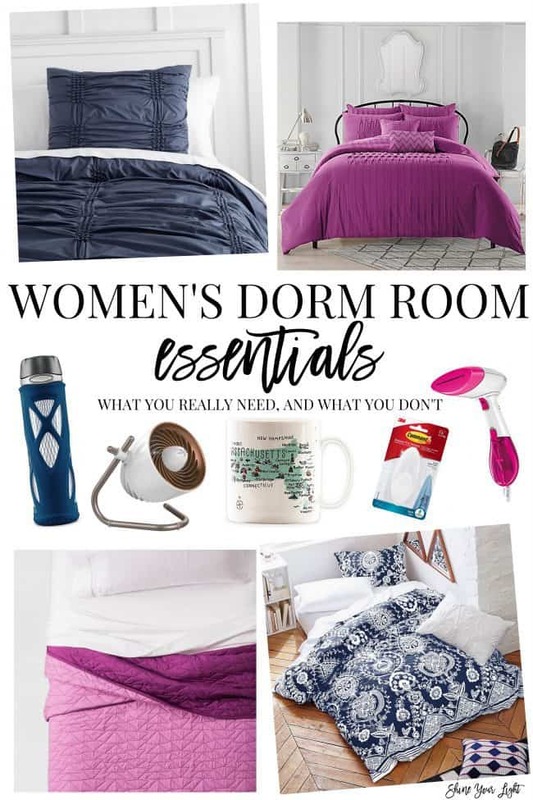 Check out the women’s dorm room essentials here! Affiliate links are included in this post; read more about them here. 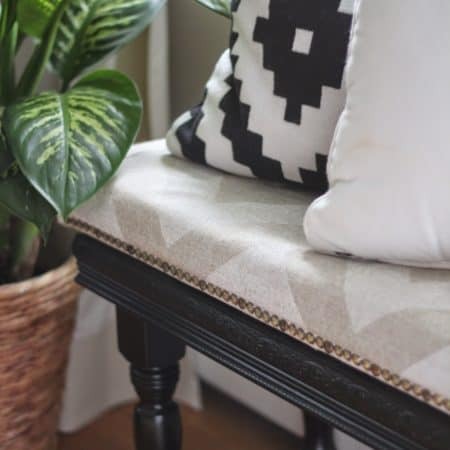 Pillows – you’ll need at least two for sleeping and lounging; keep in mind a dorm room is also a living room and those cinder block walls are not so comfy to lean against, so a big square Euro style pillow might be good for when the bed is a couch. Mattress Encasement – because how many people have slept on that mattress?? Bedbugs and other used mattress-grossness, eeew. I’m not a germaphobe, but seriously, zip that thing right up in impenetrable vinyl, thankyouverymuch. Memory Foam Topper – dorm mattresses are not purchased for their comfortability, that is for sure. A foam topper will go a loooong way to making that skinny, hard mattress it little more comfy. Mattress Pad – a deep-pocket mattress pad (15″+) will cover the encased mattress and the memory foam topper. It’s not necessary with the mattress encasement, but it does extend the life of the foam topper and unlike the foam, is washable. It also keeps the foam from sliding out of place and makes the memory foam a little cooler to sleep on. Twin XL Sheet Sets – look for sheets with deep pockets to cover the mattress and topper. Some people find microfiber to be hot to sleep on, but generally speaking it doesn’t get pilly and holds up well. Make sure to get Twin XL sheets for most dorm beds, which are 5″ longer than regular twins. Twin Quilt – we opted for a the quilt + comforter combination because Peter is going to school in Vermont and it’s all about layering in the four seasons of New England. This quilt is 100% cotton and a nice quality that will hopefully take lots of washes over the next few years. Twin Lightweight Down Comforter – A good down comforter can be washed many times and makes a fall or winter bed so comfy and cozy!! Twin Duvet Cover & Sham – there are so many pretty duvets out there for the ladies. A million. For guys, not so much. I looked for a darker or patterned one that could handle the occasional spill of Ramen noodles or cocoa until it makes it’s way into the wash (which I’m sure will not be frequent). Note – I bought TWIN sized and not TWIN XL for the quilt, comforter and duvet because as opposed to sheets, here those few inches don’t matter, and you have so many more options with the basic twin size. A few more great quilts and duvets for dorm living…. Rug* – probably will have to be thrown out within a year or two so this is a good place to not spend a lot of $$$. This one is indoor/outdoor and can take a beating. Pop Up Hamper With Handles – the mesh, breathable kind. Shower Caddy – gotta have one for shampoo/conditioner/soap/etc. Towels – the word on the street is: don’t bother with expensive towels or hand towels. Facecloths – a cheap multi-pack is perfect for face washing or showering. 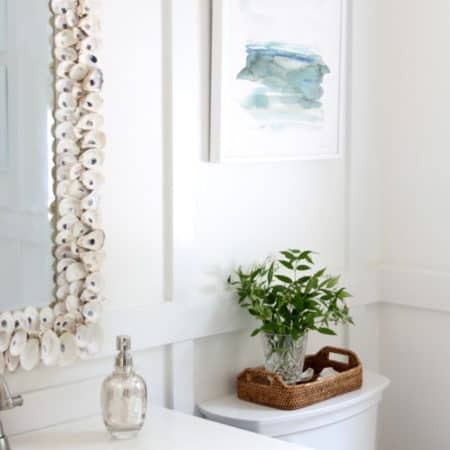 Removable Hooks For Towels – strong enough for a wet towel but doesn’t mark the walls. Removable Picture Hanging Strips – so your parents don’t get charged an extra fee at the end of the year. Iron – because when your clean laundry sits in a laundry basket unfolded until Saturday night, your favorite shirt *might* have a few wrinkles in it. Tabletop (or more likely, floor!) Ironing Board – because burn marks on your dorm room floor from the iron is so not good. OR instead of an iron and ironing board…..
Hand-Held Clothes Steamer* – smaller and easier to store, and does the trick. Laundry Detergent Pods – pods are great for dorm living because you can take just one to the laundry room instead of dragging a whole bottle of detergent. Dryer Sheets – so the laundry you left in your dorm washing machine for hours on end doesn’t smell so musty. Clorox Wipes – for those sticky keyboards, desks and post food-fights. Dustbuster – ditto on the food fights. Hangers – the cheap plastic ones will do. Power Strip – this one has 2 USB ports. Clip Lamp – for over the bed. Desk Lamp – light is kinda good for late night studying. Hanging Closet Storage – this is great for not only shoes but also rolled up towels and other storage. Keurig* & K Cups– ditto on the late night studying. Dorm Fridge* – for water. Obvi. Microwave* – check with your school and roommate. Microwave-Safe Mug – big enough for late night coffee or Ramen noodles. * All things you can coordinate with your roommate. Two fridges, microwaves, and irons are probably not necessary in one small dorm room! For Peter, I did a huge amount of this shopping at Amazon, because we have a Prime membership and get free shipping, plus the prices are often lower here than elsewhere, and Target, since you automatically get 5% off with the Red card. If you have any essential additions to this list, please share!! Have a great day and weekend ahead. Check out our guide for women’s dorm room essentials here! Going to college is so exciting! A couple of tips, most States now require colleges to have their mattresses wrapped in vinyl. You should check with you school because then you wouldn’t need the mattress encasement and could just wipe down the mattress with Clorox wipes! Also, you should get a small plate as well as the mug. 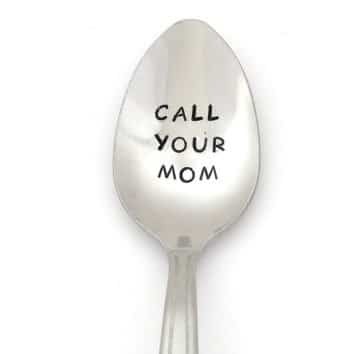 In college I had a mug, both and plate set and it was perfect. The plate was great for reheating leftovers and such! Having both a mug and bowl allowed me to have coffee and cereal in the mornings to save my dining dollars for the other meals. Just some tips, I hope hey lovely college!! My son is also heading off to college this fall. I’ve been told by several people that a mini steamer is better than an iron/ironing board and takes up less space too! Best wishes on this next phase! Oh that is great to know Susan! My daughter will be going to college next year so I’ll keep that in mind for her! And maybe I need one of those for myself!! Best wishes to your son too! Jane we just received the quilt yesterday and it’s a really nice light weight, great for layering! This is such a lovely post. Thanks for sharing.